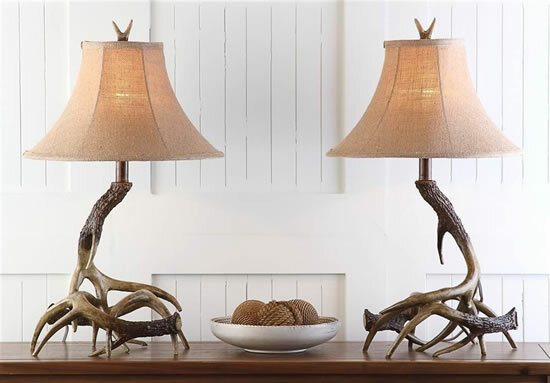 Lamp Body w/o Shade: 11.75" X 9" X 13.25"
Ideal for coastal, country and even contemporary rooms, the Sundance antler table lamp pays homage to Mother Nature. 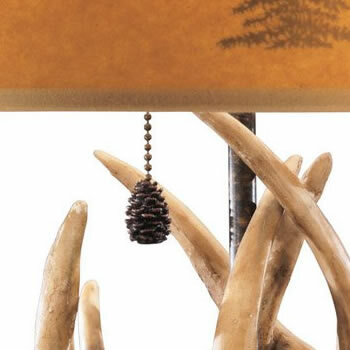 Crafted of brown poly-resin with a black neck, its rustic faux antlers form an artful base and finial atop a pretty cotton bell shade. 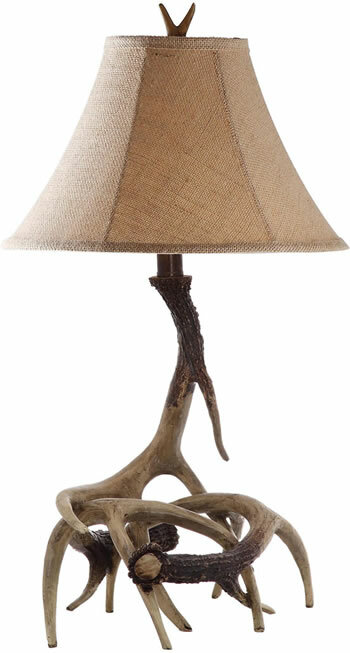 Lamp Body w/o Shade: 8" X 5.13" X 21"
Top: 11" x 1 "
Inspired by the rustic décors of chalets in the French Alps, this antler table lamp is a contemporary collector's item. 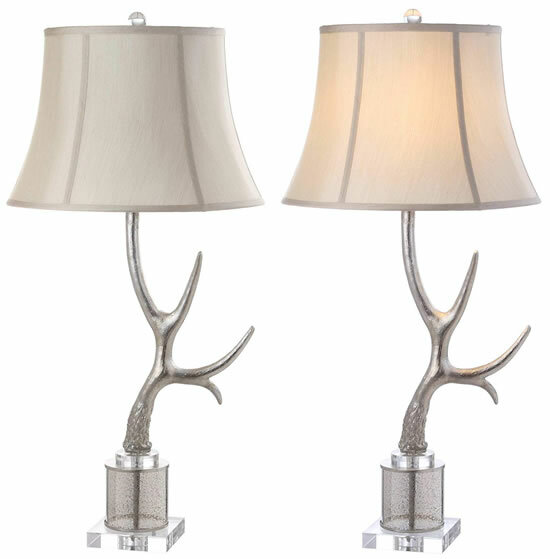 Its sculpted antler in a dramatic silver finish sits atop a luxurious glass base, creating an artistic statement in any living room. 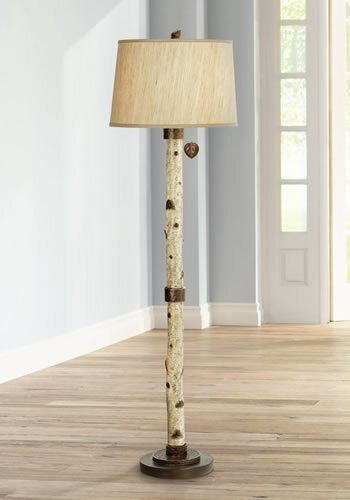 This charming farmhouse style table lamp incorporates the look of farm equipment with pipes, a gardening trowel and a small plant pot. 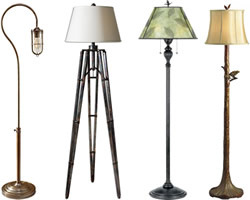 They all look like they have been at the potting bench for years. 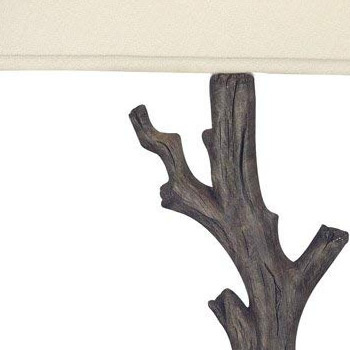 It's from Amazon. 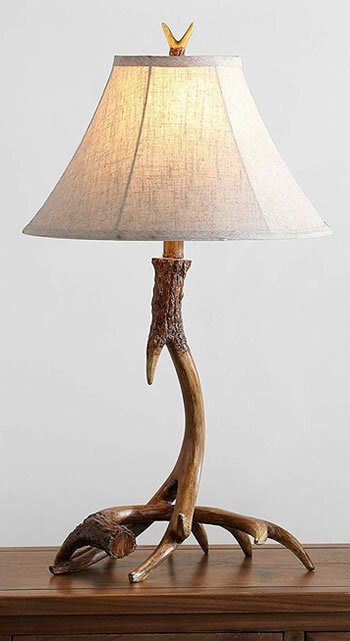 How you could you go wrong? 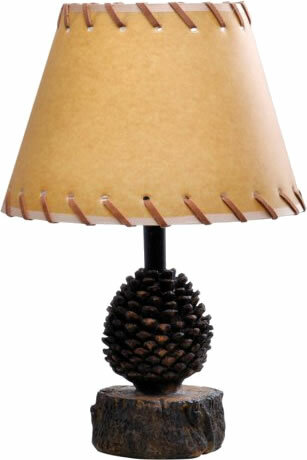 Charming little lamp looks like a pine cone balanced on a twig base. 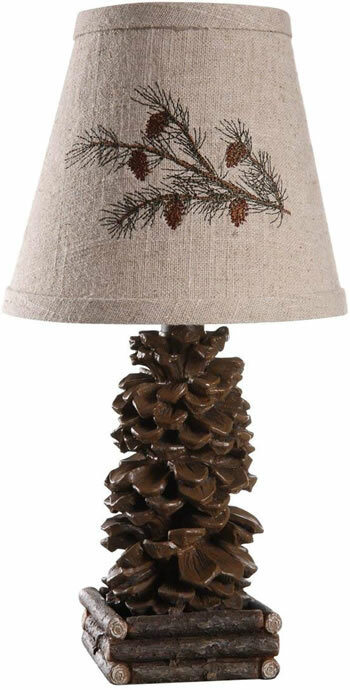 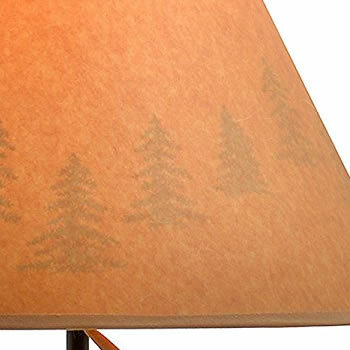 The bell shade is of slubby light brown fabric with the print of a pine branch with needles and cones. 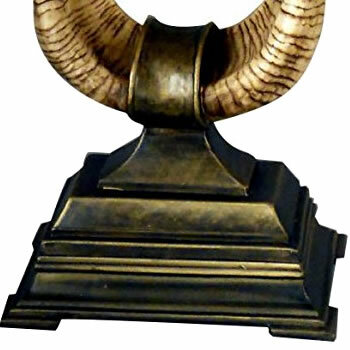 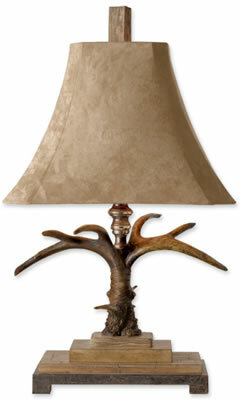 12.2" x 11" x 16.5"
This table lamp features reproduction African Thomson Gazelle Horn. 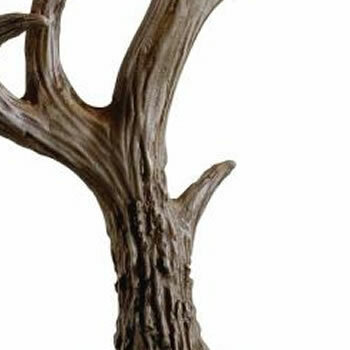 Thomson Gazelle are native to Africa's savannas and grassland. 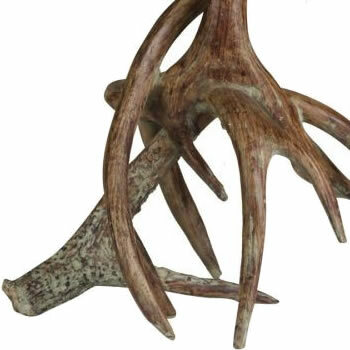 Large herds of them can be found in the Serengeti region of Kenya and Tanzania. 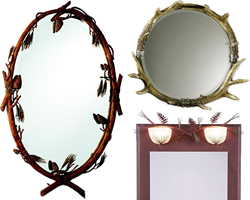 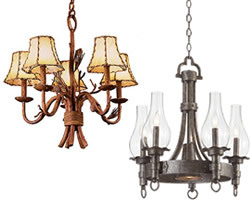 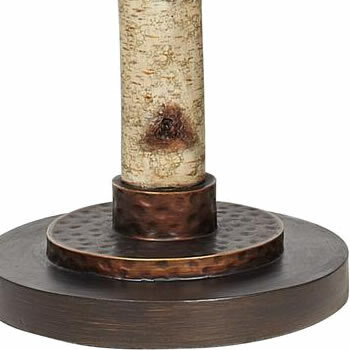 Judith Edwards Designs creates unique lighting and home decor products that blend beautifully with your style. 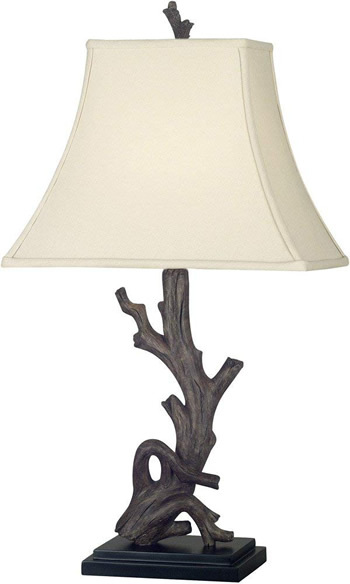 26.4" Tall x 16.3" x 12.6"
The elegantly gnarled texture of driftwood comes home in this nature inspired lamp, blending the smooth curves of the wood finish with a tailored cream shade, this table lamp is equally at home in a coastal inspired beach house or a rustic cabin. 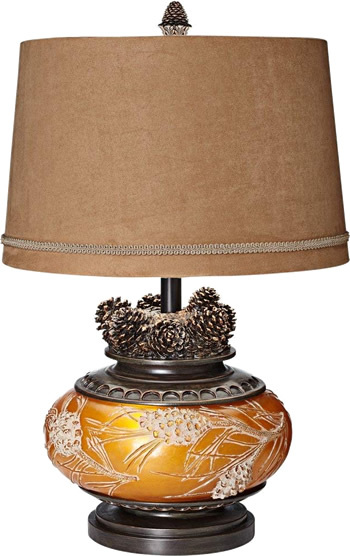 Width 12" x Height 27"
Meyda Lighting's Teepee Collection includes pendants, wall sconces and a table lamp with a Native American teepee. 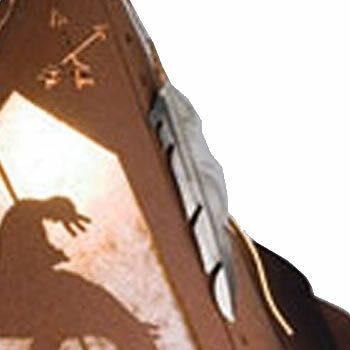 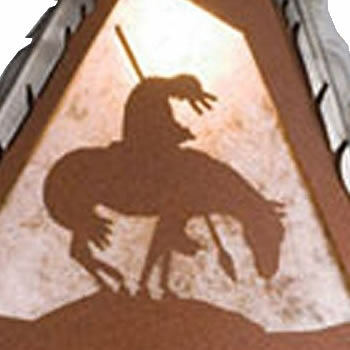 Some also include buffalo, wild horses or other motifs. 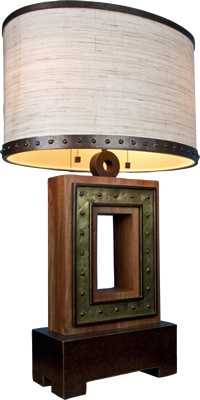 They are finished in Antique Copper and have mica diffusers. 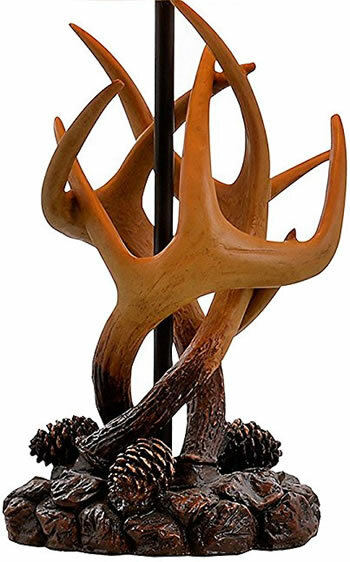 They are handcrafted in the USA by Meyda artisans. 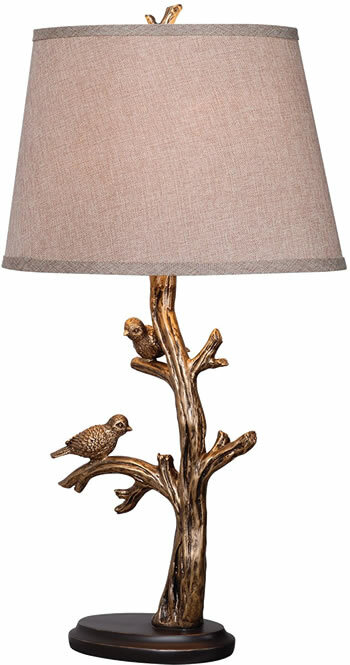 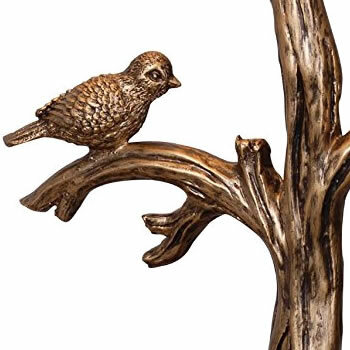 Whimsical Table Lamp and finial look like a tree with rough bark texture and two small birds. 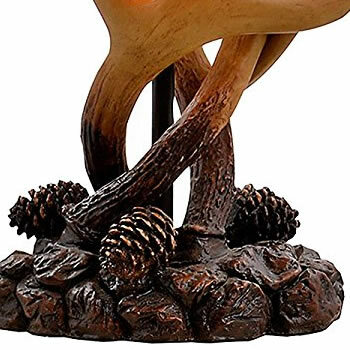 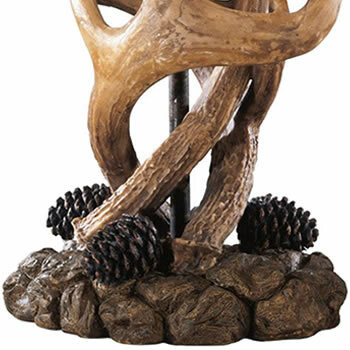 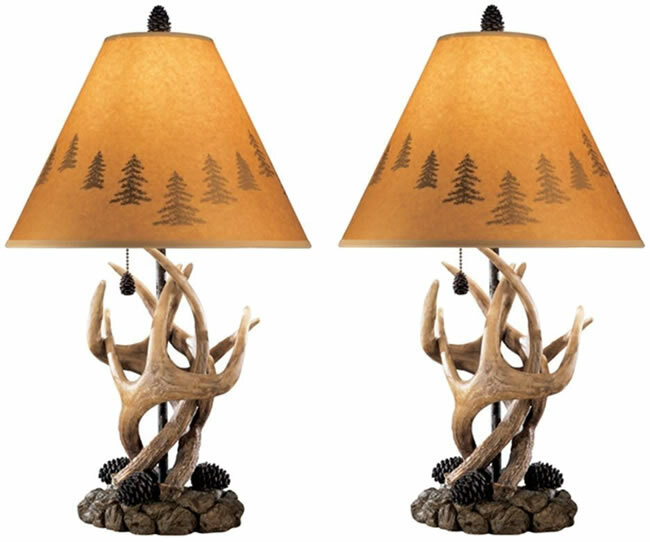 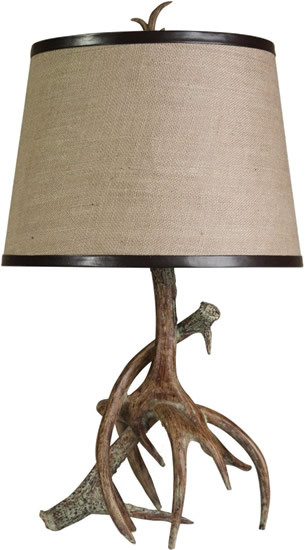 Add cozy cabin style with this faux antler table lamp. 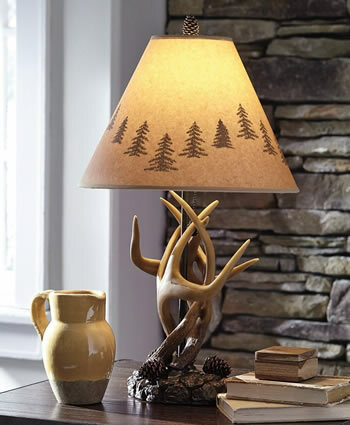 Create a classic lodge feel in your home with this rustic table lamp. 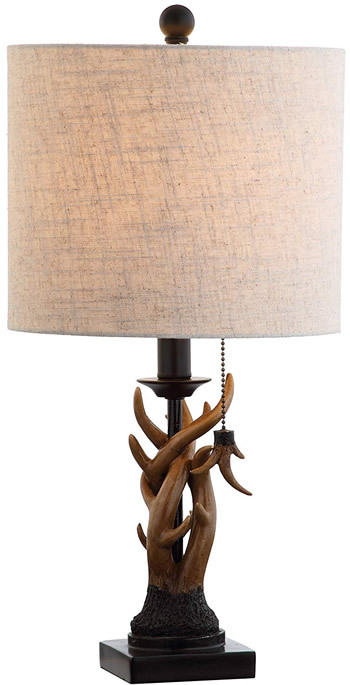 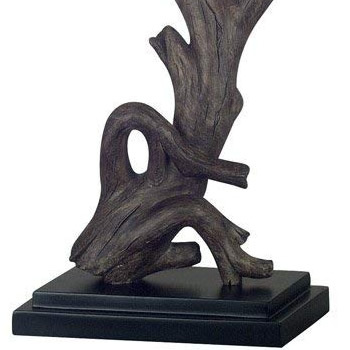 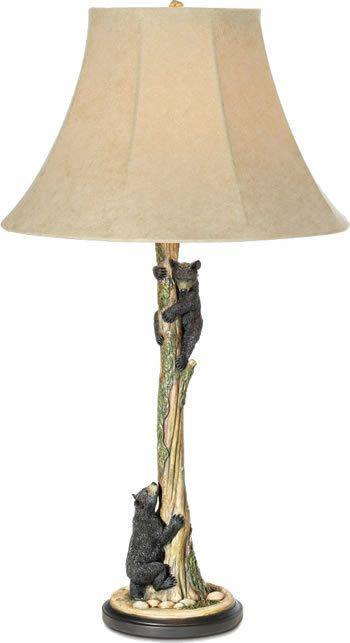 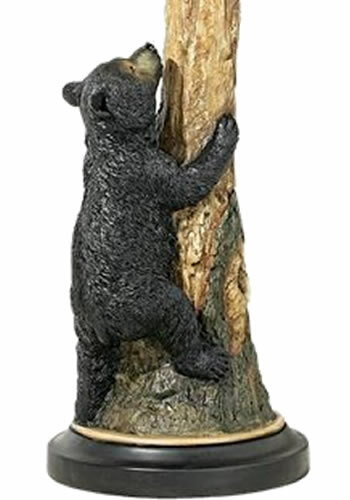 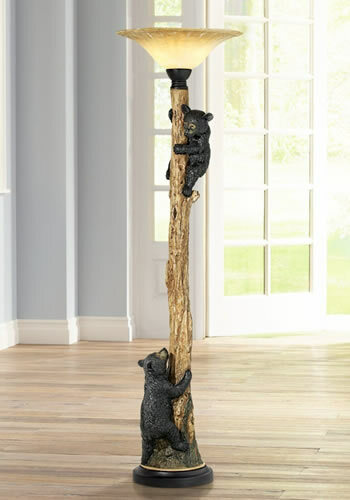 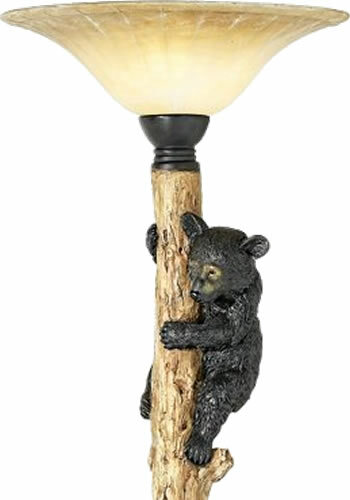 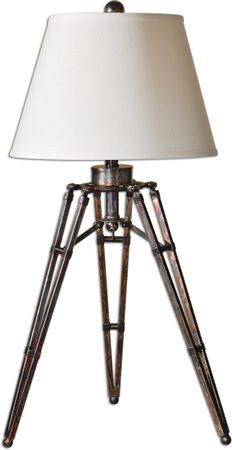 Featuring a faux antler base, this nature-inspired lamp is beautifully rugged and artistic. 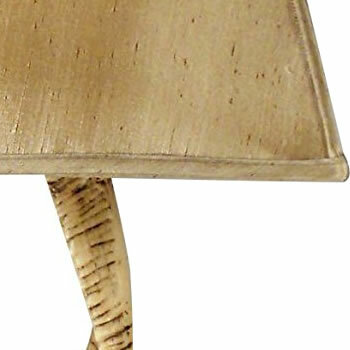 The empire shade is natural cotton with a slubby linen feel to diffuse light for a soft, warm cabin glow. 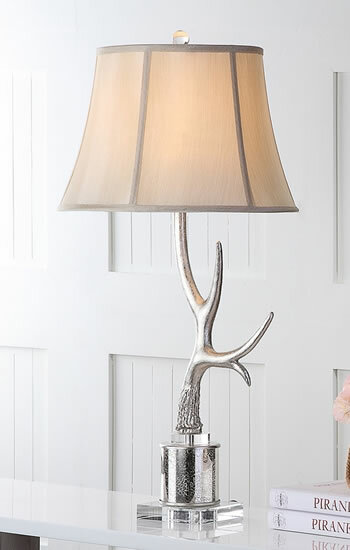 Dimensions: 9" x 26.5" x 9"
The Dalton Antler Table Lamp features realistic looking imitation deer antlers. 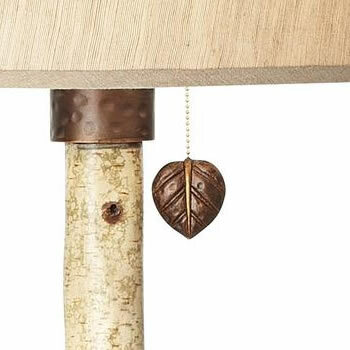 The burlap shade is trimmed with chocolate vegan leather. 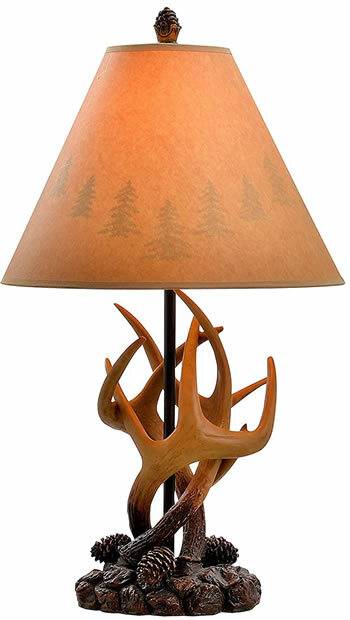 Dimensions: 24" x 22" x 11"
Shade Dimensions: 8" x 16" x 10"
Shade Dimensions: 17.5" x 6"
The Buckhorn Table Lamp majestic eight point trophy celebrates the regal buck. 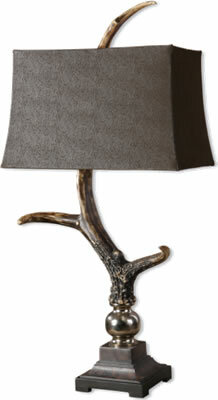 This intricately carved antler lamp is beautifully branched and mounted on a stepped black base. 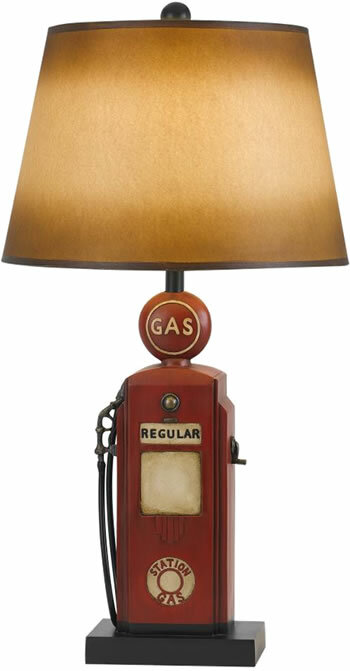 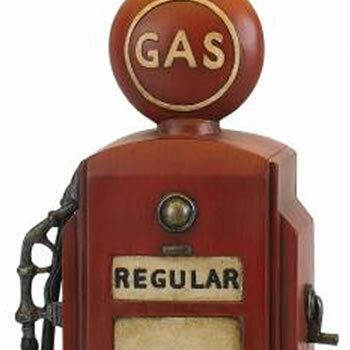 Dimensions: 14.25" x 14.5" x 24.25"
Dimensions: 14.5" x 14.1" x 24.1"
The nostalgic Gas Pump Table Lamp by CAL Lighting has a hand painted paper shade. 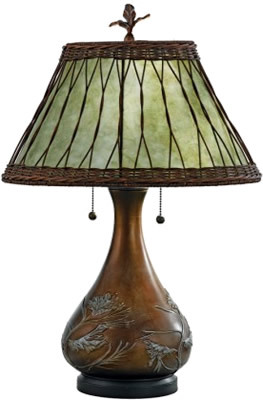 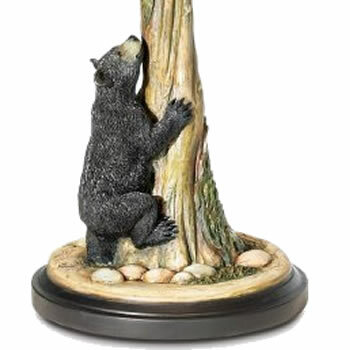 Features a soft green mica shade with a wicker overlay, and Bronzed base with an embossed pine branch motif. 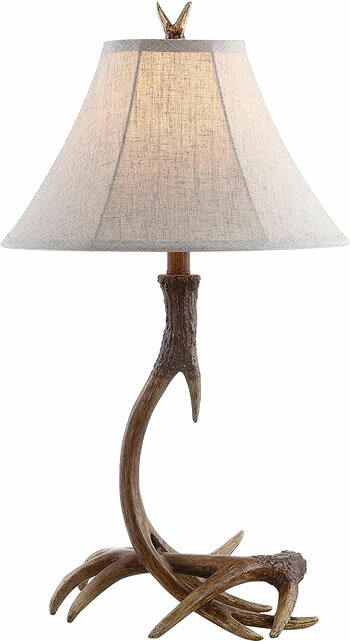 Height 25" x Diameter: 17" x 7.3"
Shade: 8 1/2" x 17" x 9"
This lamp with the look of antlers has a burnished bone ivory finish with the look of antlers with a crackled wood tone base and cast aluminum accents. 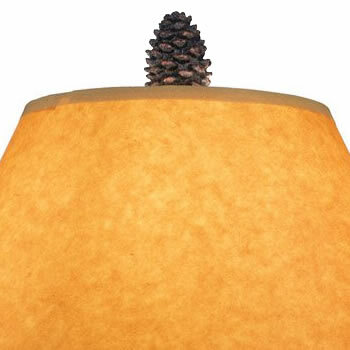 The rectangle semi drum shade is a sueded chocolate textile. 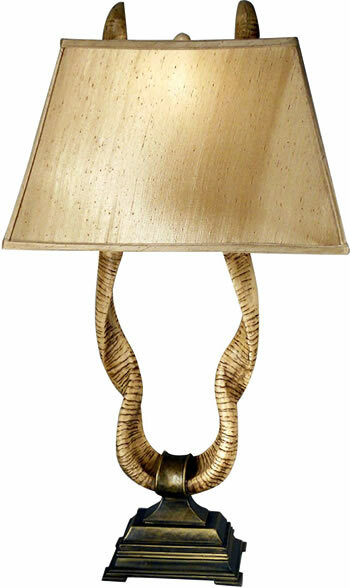 Finish: Burnished Bone Ivory Finish with a Crackled wood Tone Base and Cast aluminum accents. 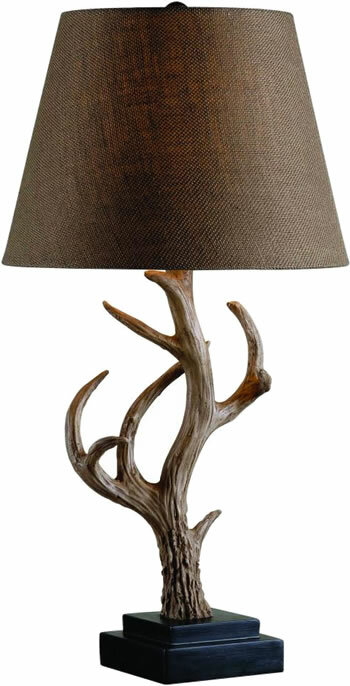 This masculine lamp with the look of antlers is finished in a natural brown and ivory with scratched silver and cast aluminum accents. 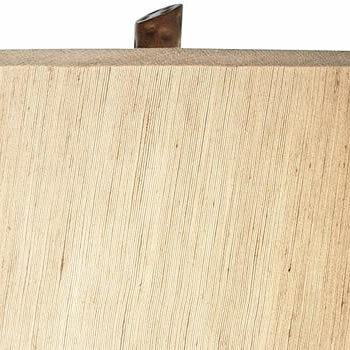 The brushed palomino sueded shade is a rectangle bell with clipped corners. 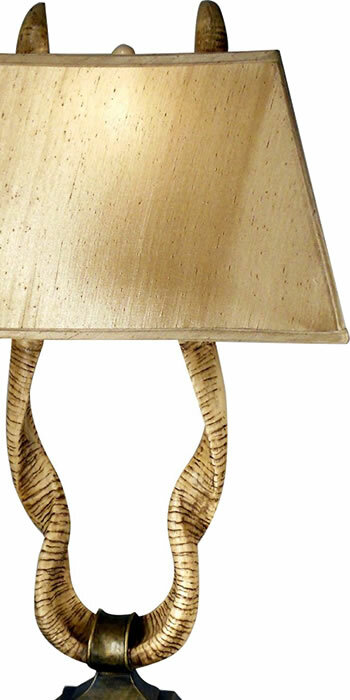 Finish: Natural Brown and Ivory Toned with Silver accents. 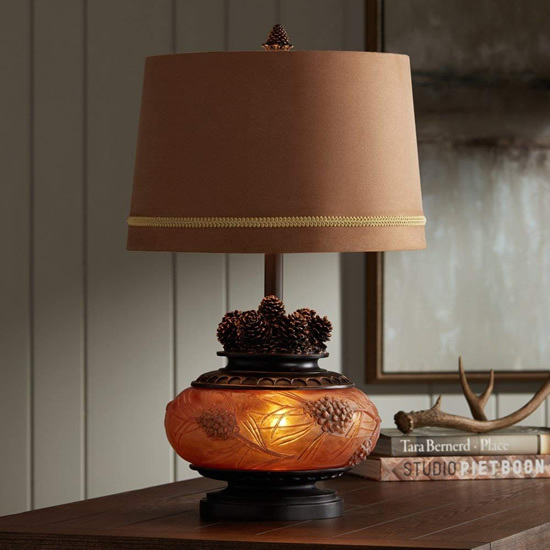 Dimensions: Width 17" x Height 32" l: 12"
Accessories: All fixtures in the Aspen Collection feature solid, hand-carved mahogany accents. 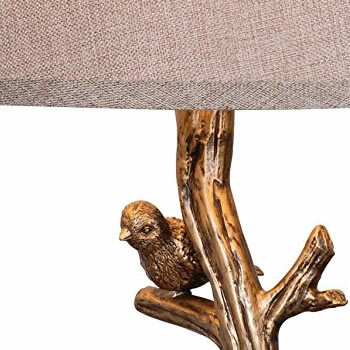 Natural material will have some slight variations in color. 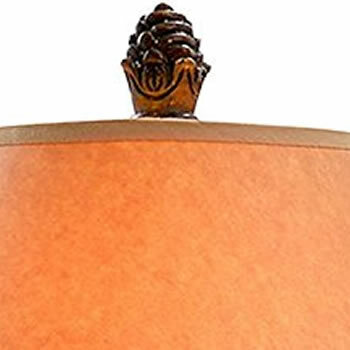 Dimensions: Width 17" x Height 30.5" l: 12"
Shade Top 14"; Shade Bottom 16"; Shade Height 10"
Shade Top 16"; Shade Bottom 18"; Shade Height 12"